The Green Screen Photo Software Bundle Lite from Westcott is a ready-made green screen package that includes a 5 x 7' cloth green screen backdrop and the easy-to-use Illusions PhotoKey Lite software. Just a single-click within the software and the green screen background is automatically extracted and replaced by the one of the 200 digital backgrounds that are included. These backgrounds cover a wide-range of subjects, with occasion-themed designs for holidays, sports, children, abstract, whimsical, landmarks, futuristic, music, and more. In addition to the included backdrops, you can also import your virtually any JPEG image for use. Once you've selected your background, you can finalize your image by using the software's editing tools that include crop, auto key color, spill suppression, brightness, contrast, saturation, blur, image flip, rotation, scale, transparency, overlay, and more. 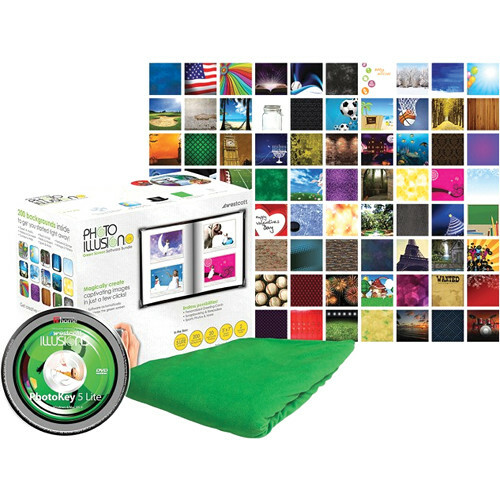 Box Dimensions (LxWxH) 14.4 x 8.2 x 6.65"
Green Screen Photo Software Bundle (Lite) is rated 4.3 out of 5 by 41. Rated 3 out of 5 by Phil from Ok I guess I haven't had a chance to use this product as yet. However I was disappointed in a couple areas. Firstly, the package included edition no. 5 of the software. The write up did not state that this was not the current edition (6). Secondly, the write up stated that 200 digital backgrounds as well as additional digital enhancements were included. As no instructions were included, and since thes items did not appear upon installing the software, I had to make phone calls and eventually learned that I needed to go to downloads on my computer to locate them. I am hopeful that the software will prove useful, but the execution by Wescott was disappointing. I trust their other products are receiving better attention. Rated 5 out of 5 by Terrill from Good Product, Excellent Customer Service I use this product to take portraits of children. Because I normally setup in my house or someone else home for my portraits I often can't get enough distance between my subject and the background to get a good blur of the background and I sometime have to use Photoshop Elements to smooth out the wrinkles. This product works well and eliminated the need to smooth out the backgrounds when I can't get enough room. The backdrop that is included is great for single portraits. However, it is very good. It is fleece and thick enough to prevent light from shining through. My only warning is that when you set up you lighting you need to make sure that no shadows are cast on the green screen. If there are shadows they will show when you change the background. FX Home is the maker of the software and I was able to install it with no problem on my PC. However, when I tried to use the cd with my Mac it could not read it. I contacted FX Home and they sent me a link to download the software the next day!!! They have one of the best customer service departments that I have ever contacted. Rated 4 out of 5 by Photosbydeniece from Install Issues But Is Now Fun Product For $ I thought I would try this product for my photography studio, product arrived as advised but the install was big disappointment. Install kept advising I needed to connect to internet to continue even though I was connected to internet. After speaking with friendly B&H rep and then friendly Westcott rep and then had to email manufacutrer for assistance as is error in their software, received email response right away. Almost 6 hours later from beginning install and then was advised to put software on a separate disc for offline and upload to computer the program then worked. Since then I have really enjoyed this product with all the fun backgrounds and overlays including using my own photo images for backgrounds. If you want to dabble in a chroma key withut putting out a lot of money this appears to be a good product once it installs. Rated 4 out of 5 by John Milton from Good for home use Family pictures work very good as the green background is removed very quickly when the picture is imported. It is easy to use after you tinker with it for a while. Be sure your subjects are well lit and the green cloth is well lit. Of course they want you to upgrade for the extended features they offer. Rated 4 out of 5 by Susan from A Little Less Than Expected This is a good starter kit to get your feet wet. I really guess I expected more for the money. There weren't many usable backgrounds included in this bundle. There was an opportunity to check out other choices if you went to another place. You had to join and then when you used the link there was nothing there. Anything you may have wanted you have to pay to use. I was very disappointed with this bundle and I had done my research before purchasing. It could be that I expected to much from this bundle. Rated 5 out of 5 by craftartphotography from Great Program This is a very nice intro package for green screen photography. Take a photo of yourself or a friend in front of the green screen. Take the photo into the software and the green screen disappears.Now you simply blend your photo with any background and you've got a beautiful new photograph worthy of framing or canvas wraps. It's so simple and cool anyone can have their own home studio. Rated 5 out of 5 by Thomas from Excellent entry to chroma key Excellent package for entry to chroma key, green screen, still photography. The screen and software are well worth the price. The screen fabric is perfect. Is the software user friendly and or are there easy to follow instructions? THIS WAS THE BEST PURCHASE EVER MADE.YOU WILL ABSOLUTELY LOVE IT. Is the 5x7 green screen compatible with the X-drop system? Wow I guess I should have goggled x-drop system first before answering ur question. I use a background stand. I'm sure the x-drop will work fine with the green screen. Does the software work with video too? As in can I use the green screen and take a video as well, not just a photo? Can I use this with a gray or blue background? The Lite version works with blue or green, but not gray unfortunately. Thanks everyone for your time in answering my question. I will give it a try this weekend. For those of you who are using this program, in your opinion, how well does the software separate and remove the chroma key color from the subject's hair? Very good, better if you use a dim backlight with magenta gel. Does the program work well dealing with the spillage of the background color onto the subject? It works well. You can adjust your color output for your background.